Cable music channel Mnet will air the variety show “Run BTS!” from Wednesday. The show, which was originally featured on Naver’s V Live, will make a debut on the small screen this time, according to the group’s agency Big Hit Entertainment. A number of popular episodes will be carefully selected and curated for the TV audience, which will air at 6 p.m. every Wednesday over a period of eight weeks, with the final episode scheduled to air on Aug. 29. 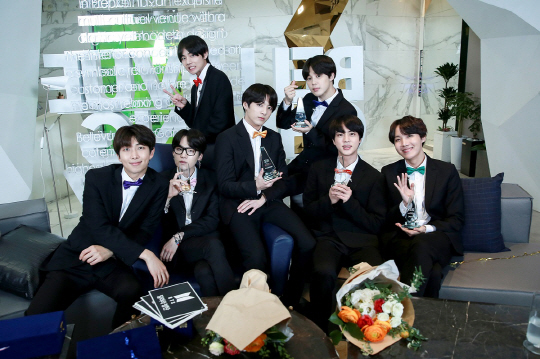 Each episode of the show featuring the seven members of the group will have a fresh new topic, Big Hit Entertainment told local press. The V Live online series has been a huge success on the platform, having produced 53 episodes as of Tuesday and still going. Episode 31, which shows the group playing a quiz show in pajamas, has been watched over six million times, the most watched episode to date. BTS has over 9.8 million followers on Naver’s V app and 11.6 million on Twitter. The group will also hold an exhibition titled “24,7=Serendipity,” which opens just days before the final “Run BTS!” episode airs on Mnet.